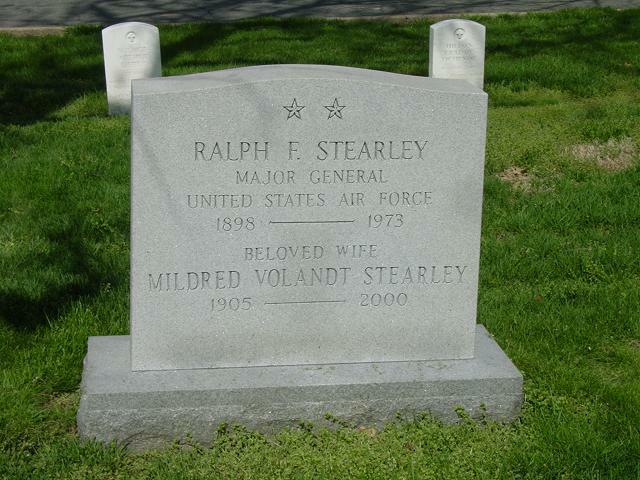 Ralph Francis Stearley was born at Brazil, Indiana, in 1898. He graduated from the U.S. Military Academy at West Point, Nnew York, and was commissioned a Second Lieutenant of Cavalry November 1. After graduation he remained at the academy until the following July, when he made a tour of battlefields in Europe. Upon his return to the United States in October 1919, he entered the Cavalry School at Fort Riley, Kansas, from which he graduated the following July. He then joined the Fourth Cavalry at Fort Brown, Texas. He entered Yale University of New Haven, Connecticut, in August 1921 and after completing the communications engineering course in June 1922 was assigned to the Fourth Cavalry at Fort McIntosh, Texas. In March 1923 he joined the 1st Signal Troop of the First Cavalry at Fort Bliss, Texas. In March 1925 he was transferred to the Air Corps and went to Brooks Field, Texas, for training. In September of that year he was transferred to Kelly Field, Texas, where he attended the Advanced Flying School. Upon graduation in March 1926, he remained at Kelly Field for duty with the Third Attack Group. He was ordered to the Philippine Islands in July 1928 for duty with the Fourth Composite Group at Nichols Field. Upon returning to the United States in July 1930, he was assigned to the Third Attack Group at Fort Crockett, Texas. In February 1934 he went to Chicago, Illinois, for duty with the Army Air Mail Operations, and in August of that year he entered the Air Corps Tactical School at Maxwell Field, Ala. In September 1935 he entered the Command and General Staff School at Fort Leavenworth, Kan. He graduated the following June, at which time he returned to Maxwell Field as instructor at the Air Corps Tactical School. In July and August 1938 he attended the Chemical Warfare School at Edgewood Arsenal, Maryland, after which he returned to Maxwell Field. In May 1940 he became assistant executive officer in the Training and Operations Division of the Office of the Chief of Air Corps in Washington, which later became the Flying Training Command. During April 1942 he served on the Canadian-American Military Board and in June of that year was appointed chief of the Air Group of the Military Intelligence Service of the War Department General Staff in Washington. He became director of Air Support at Army Air Forces headquarters in January 1943 and the following May assumed command of the First Air Support Command at Morris Field, North Carolina, which was soon redesignated the First Tactical Air Division. In April 1944 he joined the Ninth Tactical Air Force in the European theater as operations officer. The following August he became operations officer of the newly-organized Allied Airborne Army, and in April 1945 was appointed commanding general of the Ninth Tactical Air Division of the Ninth Air Force, which operated in France and Northern Germany. The following September he became commander of the Air Section, 15th Army Theater General Board, in the European theater. He returned to Air Force headquarters in January 1946 for duty as deputy chief of the Legislative and Liaison Division of the War Department General Staff. Two years later, he was appointed director of the Legislative and Liaison Division of the Directorate of Public Relations in the Office of the Secretary of the Air Force. He was named commanding general of the 14th Air Force at Orlando Air Force Base, Florida, in July 1948 and retained that position when the 14th Air Force was moved to Robins Air Force Base, Georgia, in October 1949. In July 1950 he was appointed commanding general of the 20th Air Force at Kadena Air Force Base, Okinawa. General Stearley has been awarded the Distinguished Service Medal, Legion of Merit, Air Medal, Bronze Star Medal and the Commendation Ribbon. His foreign decorations include the Commander of the Order of the British Empire, the French Chevalier de la Legion d'Honneur and Croix de Guerre avec Palme, the Belgian Order of Leopold, Croix de Guerre avec Palme, and the Netherlands Order of Orange Nassau, Degree of Commander. General Stearley has a strong interest in horses. He has always been a polo enthusiast and was a member of the 1939 Far Eastern Championship Polo Team.